This paper by Ning Tian in the Journal of Developmental Neurobiology reviews the developmental mechanisms involved in the formation of retinal ganglion cells (RGC) dendrites. The dendrites of individual RGCs are normally confined to one or a few narrow strata within the inner plexiform layer (IPL) and each RGC synapses only with a small group of presynaptic bipolar and amacrine cells with axons and dendrites that ramify in the same strata. 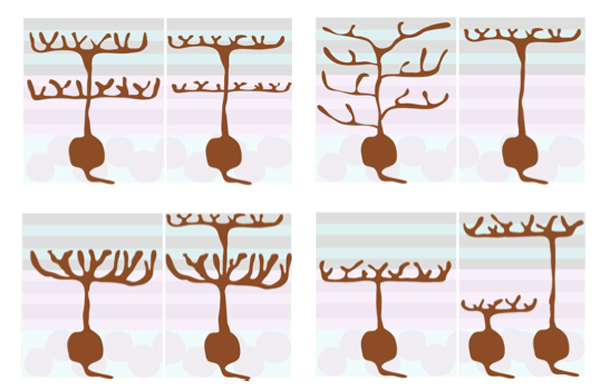 The underlying mechanisms which control the development of this laminar-restricted distribution pattern of RGC dendrites have been extensively studied, but it is still an open question whether the dendritic pattern of RGCs is determined by molecular cues or by activity-dependent refinement. Recent evidence summarized in this paper suggests that both molecular cues and activity-dependent refinement might regulate RGC dendrites in a cell subtype-specific manner.